When news that a young football team and their coach had become trapped by flood water inside Thailand’s Tham Luang Cave the world watched the events unfold in hope, in fear, with some sadness, and ultimately with elation. 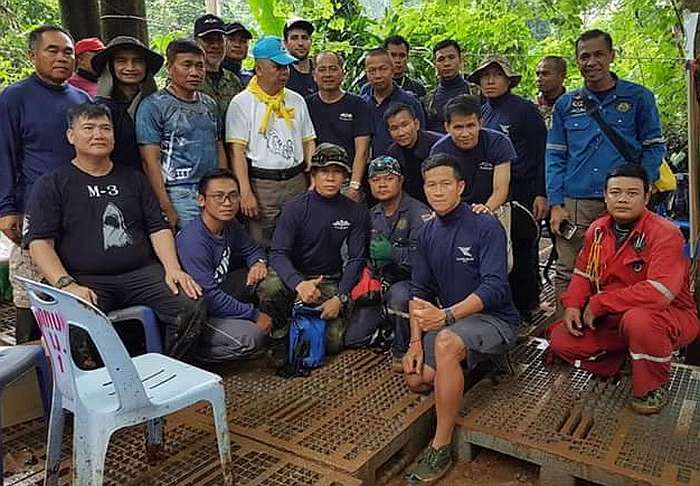 Besides attracting the attention of world media, the search and rescue of the Wild Boars football team and their coach brought together a multi-national contingent of specialists and volunteers to assist the efforts of the Thai emergency services and Thai Navy SEAL’s. Fernando Raigal is a professional diver currently living in Thailand. He joined a team of Thai ex Navy SEAL’s, one of who sadly lost his life during the rescue effort. This is Fernando’s account (via questions and answers) of his time at Tham Luang Cave. When did you learn that the Wild Boars football team and their coach were lost in Tham Luang Cave? Around June 24th or 25th started following the news. When did you join the rescue effort? Why did you decide to volunteer to join the rescue effort? I was thinking about it however thought that the Thai Navy won’t accept foreign dudes if they were not “elite” cave divers. At about 23:00 July 1st I got an email from an ex navy seal who is owner of a local Thai commercial diving company. He said that he’s got involved there as part of ENSED (ex navy seals group) and that they needed more “professional” divers. He also asked me if I was on land and if I could get a flight myself and get up there the soonest. I looked for flights immediately, however there were no flights until 06.30 July 2nd so that’s what I booked and reverted to him. ENSED organised my pick up and took me under their wing. What was your part in the rescue at Tham Luang Cave? There has been two main stages: Search and then Rescue. During the search I was opening up the way inside the cave with the ex navy seals, diving, walking and some climbing as required. Rope guide installation along the submerged passages. Supply of air dive tanks, oxygen tanks, food, drinking water, communication equipment, spot lights etc. Rope guide installation just after chamber 3 up to the T junction. So we could move forward into the cave in a safe fashion while trying to reach the kids and their coach. We had to do this in stages as it could not be done in one go, even if you somehow could carry with you several 15 litre air tanks. During the rescue operation the cave was in a different state as industrial pumps had managed to drain thousands of cubic metres of water. This meant that many areas and narrow passages that you had to dive before (in zero visibility and high current) were now walk-able/swim-able. Recreational cave divers along with some navy seals were the guys diving further down the cave, carrying back the kids in full face masks. Then they were passed onto our section (ex navy seals) and we were responsible to carry them out the cave on stretchers. Also, between these two main stages there were some days of not knowing exactly how we will rescue them. During this time as part of ENSED we will dive, walk, climb as required to get O2 tanks, air tanks, food and water down to chamber 3. From there the navy seals will get supplies to the stranded children. Fernando and members of the ex Navy SEAL’s team working inside Tham Luang Cave. Why were the Wild Boars so deep inside the cave, did they head that way to escape the flood water? Probably. Its not known at this time, I guess the kids and their coach will have some explaining to do very soon. At this time there is only hypothesis. What was the longest distance the children and their coach had to dive? Thanks to the industrial pumps and a few days break from monsoon rains the longest dive was just over 150 metres. How far did you have to carry them through your section of the cave? I was in chamber 2, passing the stretchers as they came and the ground was debris and rocks (easy to get unbalanced). Each one of the guys there only had to carry the stretchers for a few metres, whatever you could do in a safe fashion to avoid any risk of falling and the stretcher along with you. What condition were they in when they reached your section? They were “relaxed”. Most of them were sleeping due to effects of some drugs. I don’t know what the drug was, medics and doctors involved were the ones managing that. How and where did all the rescue teams eat and sleep during the operation? Anywhere you could. Local farms, home-stays, hotels, local houses. Everyone got involved and they did not charge for it. Myself I was lodged in a home-stay nearby along with ENSED members, apart from one night spent on a yoga mat in chamber 3. Was there ever any difficulties due to language barriers? Sometimes, but they were rare. Plenty of ENSED members trained in the USA, so their English was really good. Whenever there was a language barrier it was not long before someone around could translate. How would you describe the diving conditions? Cold water, muddy, zero (or next to zero) visibility, strong current, narrow passages, sharp edged rocks around you. Was Saman part of your team? Yes. He was a member of ENSED, total of just under 20 dudes. I was “adopted” in their unit. Met him for about 3 days prior his death. I could tell he was experienced, fit, calm, and his English was above Thai average. What was the worst, or lowest point of the experience for you? No doubt it was the loss of Saman. It was a hard hit for everyone, that came to show the dangers that we were exposed to. We had to quickly leave it behind as well as any other sad or negative thoughts and focus on the mission, which was still to be achieved at that point. What would you most like to tell people about your experience at Tham Luang cave? I will not start any conversation about this. If asked, will emphasize how a large group of divers with different backgrounds, languages, nationalities, specialties was able to coordinate itself and work on the same direction in such a short time, until we achieved success. 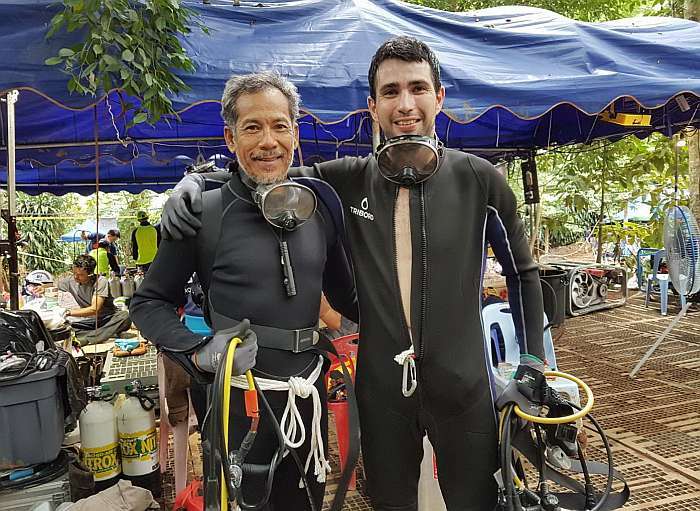 You can find more reference to Ferndo’s participation in the Tham Luang Cave rescue effort on this article from ELPAIS. The UK Royal Navy Clearance Divers Association (RNCDA) has set up a fundraising effort for the widow of Saman Gunan. If you would like to donate, or share, just click on the link https://www.justgiving.com/crowdfunding/glyn-holgate. On lighter note: you might like this account of a diver’s encounter with a sea turtle.